Landscape Photography Blogger Note: My photoblog friendship with Greg Russell developed over the last year or more through an exchange of many e-mails and phone calls on the state of photography today and yesterday, philosophy, and our development as photographers. This essay came out of our conversations. Concurrently on Greg Russell’s photoblog Alpenglow Images, he has posted an essay I wrote called, “Make Your Own Tripod Tracks.” For more background on Greg Russell see the blog post, “Monday Blog Blog: Greg Russell, Ph.D.” or his own short bio. 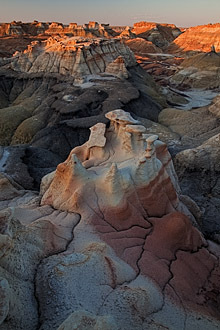 Early Morning, Bisti Badlands, New Mexico, copyright 2011 by Greg Russell. Hmmm…that brings up an interesting question. Imagine yourself on the trip of a lifetime, possibly even knowing you’re going to be one of the last people to see a particular canyon before it disappears underwater forever. How would you react if your camera got filled with sand? Today on my blog, David Leland Hyde in his blog post, “Make Your Own Tripod Marks,” likens landscape photography to trophy hunting, with intense competition to get “the shot.” Indeed, despite the camaraderie, things have evolved into a very “me first” sort of culture. As a result, as soon as a new location is discovered (and its coordinates disseminated), it quickly becomes part of hundreds of photographers’ libraries. Mark Meyer has written an excellent article on the landscape photographer’s repertoire, which describes the mentality of this culture very well. Rather than rehash Meyers’ comments (he makes his point much better than I ever could), I wonder to myself, can we move past the repertoire? Can we discover our own little wild places, places that inspire creativity based on our own discoveries, our own way of seeing? As a beginning landscape photographer, it seemed logical and intuitive for me to learn about composition and exposure by following in the footsteps of photographers who inspire me. I visited the classic viewpoints—Mesa Arch, Tunnel View—and in all honesty, I don’t regret it. I think everyone should see sunrise at the Towers of the Virgin at least once. However, I began to realize that by visiting these locations and making the same compositions as everyone else, my creativity was impeded. By photographing the repertoire, my technical skills matured, but when the time to look for unique, incongruous, compositions and to attempt to break the “rules” in an artful way, it was obvious to me. In other words, it was time to put down the roadside guide, to stop letting highway pullouts dictate what would make an interesting photograph. Wave Abstract, Channel Islands National Park, California, copyright 2010 by Greg Russell. It was my voice, not the voice of others, that I wanted people to hear; speaking for the land, in my opinion, is an important aspect of being an artist. All of this isn’t to say you should avoid Yosemite Valley at all costs, or that you should never venture into the eastern Sierra in October. What I am saying, however, is to enjoy the landscape for its own sake. Ask yourself, “If I forgot my camera on this trip, would I still be enjoying myself?” After all, the first step to moving past the repertoire is to foster a connection with the land, not to race everyone else in documenting it. Hi Kevin, welcome and thank you for your comment. I can’t imagine passing up the opportunity to see the side canyons of Glen Canyon for any reason. People who think like that don’t belong in special places like this,can you imagine what the Kolb brothers felt like when all of their camera gear got wet and filled with sand in Lodore canyon . They did not quit, but stopped cleaned the cameras and made beautiful photographs on the way down the Colorado river system. I know you are not going to fix a modern digital camera in the field today, all I am saying is stop take a deep breath and and enjoy the hike for you may never pass this way again. No doubt, that’s right, Randy. This is a fantastic article. Greg makes a great point when he states, “I visited the classic viewpoints—Mesa Arch, Tunnel View—and in all honesty, I don’t regret it. I think everyone should see sunrise at the Towers of the Virgin at least once.” I certainly have my share of “cliche” shots, but they the beginning steps in my long journey of photographic education. The important thing is to learn from the experiences and move on to undiscovered country. If we don’t take that next step, we’re just regurgitating the works of the masters before us. Jim, I agree. One of Greg’s best points is that all of these iconic locations are worth seeing and even photographing for our own inspiration and study. > own discoveries, our own way of seeing? I am not sure what is there to think about so much. You don’t need some fanciful place to inspire creativity. Rather, its your creativity that can show the inherent beauty in almost any place. Hi Anil, thank you for your comment. To be sure many of these ideas can be over thought and Greg and I may be just as guilty of that as anyone. Maybe I should only speak for myself. “I” am just as guilty of over thinking as anyone. Though mulling over your purpose in photography, how much to challenge yourself and what type of photographer you wish to be are not exercises without merit. I agree that creativity bringing out the beauty of a place is preferable to depending on flashy places to spark creativity. Edward Weston said he could look at his boot and find a great photograph. Excellent post Greg, and great idea posting on each others blogs. Like I mentioned on David’s post over at Alpenglow, there’s nothing wrong with photographing icons. What matters is how you do it. You can be original or you can be imitative. Your choice. Or you can choose simply to connect with the area, let it seep into your being, and not photograph at all. Hi PJ, I appreciate your perspective. I like your point about connecting with the place, icon or not, photographing or not. I agree completely with you PJ…just because its an icon doesn’t mean you can’t connect with it. One of my favorite places to “just be” is El Cap Meadow in Yosemite. Icon? Yep. Will it stir your innards? You better believe it. Anil, I’m sorry if my writing muddied my point. I agree with you 100%–you don’t necessarily need to go some place special for photography…discovering you own little wild places, as I wrote is what photography should be all about. Hi Greg, As several people have mentioned here on your post, on my post on your blog, and elsewhere, sometimes it is better to leave the camera at home and just enjoy. I do it all the time, but that time is not thrown away in relation to photography: it sharpens my eye. Thanks, everyone, for your comments. I agree with them all. Jim, I think you nailed it when you talk about the ‘next step’–that can be a very difficult step to take. Considering most photographers also hold full-time “day jobs” time can be limiting and hitting the “icons” can be much more convenient than wandering. Plus, as Andrew Hardacre wonders over at my blog, even if a photographer does take that step and start producing original work, will he be drowned in the sea of mediocrity? Hello, Greg. Being a self educated photographer, I of course found my early inspiration in the works of the masters. I never thought about it in terms of “I have to have THAT shot” when looking at other photographers’ work. Rather, if I admired a print of Half Dome by Ansel Adams, then I wanted to photograph in Yosemite. Simply by talking to rangers at the visitors centers in many National Parks, I’ve learned of dozens of locations around the southwest that I would have never discovered on my own, and that are not in books. I try to use the big locations as starting points. You used the word “repertoire” in your post and I believe it is the perfect word for how I approached photography in the beginning. Just as a classical musician is expected to know and be able to perform a certain body of music, so too I believed the landscape photographer was expected to have photographed in certain locations. But again, it’s the location, not the “shot”. Continuing with the music analogy, Ansel Adams once said that the negative was the score, and the print the performance. He said that because a static negative can result in a wide variety of prints depending on who is in the darkroom. I’d like to expand on that sentiment and say that the subject is the score, and the photograph (composition) is the performance. As Jim Goldstein said, it’s a matter of finding a different perspective. But even without the intent to copy, there are consequences when shooting popular locations. I shot Mesa Verde for the first time a couple years ago. Just recently, I bought a used book of David Muench’s National Park work, and inside was a shot of Spruce House that looked very similar to one of my images. His book was published in 1993, 11+ years before I even bought my first camera. They’re not identical, but putting the two images side by side, anyone would conclude that I copied him although I didn’t even know his image existed. It’s impossible for there to be no overlap when so many photographers explore the same scene. As a side note, the image of the bridge in Zion (classic autumn shot of the Virgin River in front of the Watchman, anyone?) on Goldstein’s blog is a mirror of what it’s like to shoot the Maroon Bells in Colorado during September. If you want a different perspective and move to a position where you are now in the “classic shot” of all the other photographers, you will be harassed, insulted and threatened until you move. Essentially, the site has been taken over by copyists who ensure that an original shot is no longer even possible! I apologize to both you and David for taking up so much space here, but I’m glad you raised this complex topic. It’s something that should be in the minds of all serious photographers, whether amateur or professional. And thank you both for turning me on to some new blogs! Hi Jim, thank you for returning for this thought provoking comment. I appreciate you touching on the issue from many sides with interesting observations on each. What happened to you at Mesa Verde probably occurs much more often than many photographers realize. Thanks for following up, Jim. I appreciate it, and I can certainly get behind you furthering the analogy of photography and music. There are indeed many parallels. I laughed when you talked about your experience at Mesa Verde. So true. I have a star trail from an arch in Joshua Tree that I made a couple of years ago. I love the image. The next year for Christmas, my in-laws got me an Art Wolfe book–guess what I saw when I opened it up? A nearly identical star trail image of the same arch. I couldn’t believe it–I had never seen Art Wolfe’s image before, but I had a nearly identical shot in my files. I agree that its impossible for there to be no overlap. Going back to that busy evening on the bridge in Zion…how many nearly identical images do you think came out of that evening shoot? I remember one October morning in the eastern Sierra. I had gone to shoot fall colors with a friend who had never visited the area before. Fall colors were dismal, so we decided to spend the day hiking, but I took him to Mono Lake at dawn. In the South Tufa parking lot, I counted 45 cars, and assuming 2 photographers/car, I just turned around and left. We went to another side, nearby, and had the place to ourselves. I think the more one “feels” for their images, the more powerful they will be. My own feeling, as it were, is that I want to evoke the feeling of wilderness, and in many cases, peaceful isolation. How do you do that if you’re elbow-to-elbow with other photographers? Thanks again for your comments! They’re insightful and I appreciate them! Thank YOU for following up, Greg. I appreciate you stopping back here and engaging in the discussion here as well as over at your place. Both seem to be sparking some interest. Great thoughts and well expressed Greg. As you know, I spend most of my time in the woods around here looking for the little things that others don’t see..or bother to. That said, when I do get to travel and see other parts of the world, I would consider the “icons” a starting point. They are “icons” for a reason and we all should try to appreciate them. And I also think having our own shots of them is good…but as pj states above…make your own vision and not someone else’s. Seeing what Philip saw is a good thing, but if you copy what he did with it then it is still his shot and not yours. I’ve been fortunate that I’ve just had a camera quit on me once in the early years of whale watching before it was all the rage. The breaching orca was still a thrill even without the trophy shot. This cross-posting is a great idea, David and Greg. I’m off to check out David’s post now. Hi Steve, I appreciate your comments here and on my blog post over at Alpenglow Images. You touched on some thought provoking ideas over there. Here you mention the “trophy shot,” ah yes, but is hunting trophies an art form? You’ve adeptly articulated what has galled me about this profession for many years. When I was on assignment in Yellowstone for Kodak, I realized the futility of one more lens among millions of dollars of photographic glass pointed at the same wolf. I came home determined to find my own niche by expressing myself through the natural history of my own home ground, nearby, though wild places where mine would be the only tripod impressions. Yes, Mesa Arch and bull elephants are part of my gallery, but the bulk of my work consists of unique views of less exotic subjects artfully rendered. Hi Gustav, welcome to Landscape Photography Blogger and thank you for your participation. Never fear, all that lens glass trained on one wolf at Yellowstone, or one Tunnel View in Yosemite, Zabriskie Point, Maroon Bells, Niagara Falls, Giza Pyramids, Ponte Vecchio or any other beaten to death frame is good for someone: the camera companies. Lots of tidbits in this post as well as Davids post on Greg’s website. I like Greg’s statement “foster a connection with the land.” It seems to me too much of our society is confined to cubicles and couches. The only connection we have to nature is through images. How much of our voice really is the voice of nature we receive from the experience of being in nature, the cold, the wet, the quiet, the solitude? As a growing photographer I find we need that connection to our subjects whether that is portraits, a street scene or landscapes. Both of your posts have me thinking. I like that, so thanks guys. Thank you, Monte. As a society we have forgotten to at least some extent how to connect or feel anything. So, it’s no accident that many landscape photographers don’t even connect to nature. It takes diligence, work and maybe a bit of that solitude you mention to learn to feel and connect again. I know that people do find resonance with nature through photographs, but I doubt that it is possible to any significant extent when the photographer is not connected to his or her subject in the first place. Thanks, guys, for your comments. I appreciate your thoughts. Steve, I agree that the icons do make a good starting point, especially in unfamiliar territory. As I step further away from the icons here in the Southwest, I grow more and more accustomed to the concept of the “photo walk” as I call it–just going for a walk with my camera (with no expecations) and seeing what I discover. Gustav, I always appreciate your input as well. I suppose in some ways I am preaching to the choir because I can sympathize fully with the idea of exploring your “own backyard” more and more these days. There are beautiful landscapes everywhere! Dear Greg, as you are sitting on your couch laughing at yourself, I am sitting on my high horse crying about myself. I wonder about my comment above regarding people in our society in general having lost much of our ability to feel and connect; and it taking extra attention to get that ability back. I hope my comment doesn’t come across as “elitist and judgmental,” but I believe it is true. I suppose what I say can sometimes be interpreted as arrogance, but I do it to rile people up and hopefully get them to see things another way, which in and of itself I suppose is somewhat presumptuous of me. Thank you for returning, Steve, and for your contributions to this discussion. David, I was actually sitting on my couch icing a nagging running-related injury. In almost 20 years as a runner, nothing has prevented me from running as much as this most recent muscle pull. I believe though that recovering from it will take discipline, and some hard work as I ease myself back into my previous running routine. Thank you. Well said. I wish you a faster than usual recovery. Have you talked to large format photographer Michael E. Gordon about his accident, complimentary medicine and other health alternatives? Is that question in line with Moving Past The Repertoire? Another fine article to read side by side with the one by David on Greg’s blog. In all those instances, I smiled (after cursing) then settled back to enjoy nature, wildlife, silence, solitude, peace. All these things have gone into making me a better photographer. We earn our stripes in nature photography – the knowledge, planning, consciousness and awareness that links us emotionally to our subjects and is thus brought out in our work. I did my own comp chasing on visits to Canada and the US when I was very new to Landscape Photography, bu no more. Hi Alister, thank you. Greg is a wonderful writer with great ideas. I notice you do some interesting writing too, on your blog, and nice photos too, what I saw. I will have to go back again. I’ve been there before, but I need to take more time. Yunnan, I didn’t remember where that is, until I looked it up. I found it is a mountainous province in the far Southwest of China. So, probably among other foreign places, you like photographing the Southwest…? My father would have loved to get to China and see more mountains. He used to say he collected mountains. Nice sometimes though as you say to just enjoy the scenery without collecting too. Nothing new to really add, David – nice touch with you and Greg swapping posts. You have generated quite a bit of conversation and that’s never a bad thing. Thanks, Derrick. I appreciate it when you stop in. 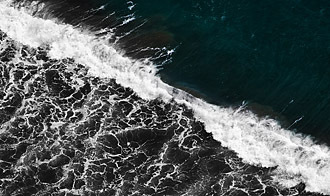 Greg, this wave abstract shot and the one you posted on your blog called High Sierra Reflections are wonderful examples of using your own voice in photography. Really outstanding and original work that stands apart.